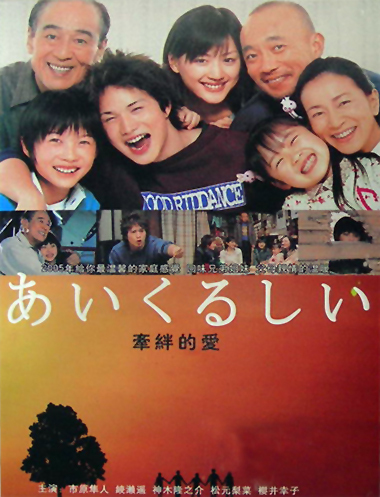 This drama revolves around the Mashiba family of 7: Tetsuo, the loud father (Takenaka Naoto), Meiji, the free-spirited grandfather (Suginara Naoki), Yumi, the sick mother (Harada Mieko), Michiru, the clumsy oldest sister (Ayase Haruka), Go, the ‘almost’ yankee brother (Ichihara Hayato), Horo, the strong kid (our narrator)(Kamiki Ryunsuke), and Uta, the cry-baby youngest little sister (Matsumoto Rina). Horo has never cried before, or to say he doesn’t know how to, so as his mother becomes sick, and everyone starts to cry, he finds himself in a situation where he doesn’t know what to do. He befriends ‘the weird kid’ Nagumo Shu (Hongo Kanata), who lives with his single mother, and Sakamaki Nana (Shiho), who tries to make her guardian angry by doing stupid things. The story focuses on how the family copes with the mothers hospitalization, and how there are big problems in different families, even though they live on the country side. I loved the drama, though I have to say some parts of the love story kind of made me annoyed, mostly the Ayase-Oguri love story. It was sweet and all, but damn that girl had a fast change of heart. But otherwise, I found everything brilliant, from the fights at the dining table; to the search for “Rainbow-Soldiers” (if you watch it you’ll understand). And I finally realised what it means when actors shine through the screen. When there are a lot of actors, it’s hard to make all of them look good, which sort of failed for Ayase (though her performance was decent – don’t get me wrong I’m a fan!). Ichihara Hayato, Oguri Shun and Kamiki Ryunsuke shined trough, and made me like them even more. This drama is TOTALLY a family drama, and it’s REAAAAAAALLY heartfelt, so if you want to watch something like that, this is a GO! ☆☆☆☆ / 4 out of 5 stars.